Each and every Wednesday we hope to share some of our favorite Emily Ley goodies with you. The shop is packed full of fun, colorful and useful things for our busy lives. BUT, there’s even more amazingness on the docket of the EL Shop! We’ll be debuting lots of new products, showing you how we use them, and sharing the WHY behind it all. 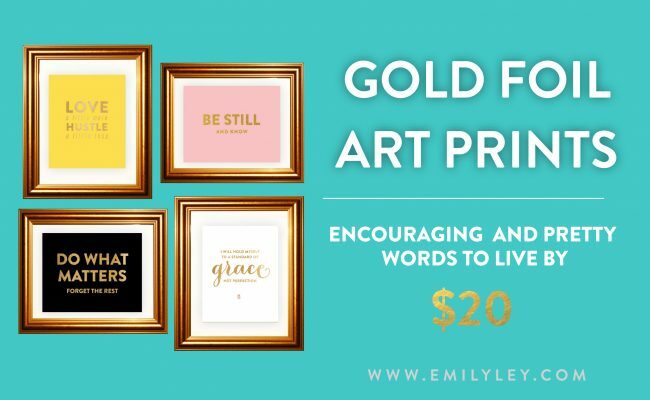 This week, as we celebrate Emily—it seemed only fitting to start with our beautiful gold foil art prints! The “Grace Not Perfection” print was so eloquently (and amazingly) penned by Emily and has become the mantra over here. And, I think for hundreds of other women everywhere! This print, and a few new ones are in the shop now! Tomorrow is Emily’s big day, so if you’d like to leave our birthday girl a wish for her 30’s—feel free to leave a comment here, or tag #happy30em over on Instagram.